I have created a form that our folks will use to input attendance of our church. I have created a field at the bottom that's called "Today's total attendance" for the particular date field called "date of service". Is there anyway to create a form or report where i can place a range of dates that will result in the average attendance between the two dates? If I understood you correctly you want to calculate average attendance from "Today's total attendance" field, between the two dates. 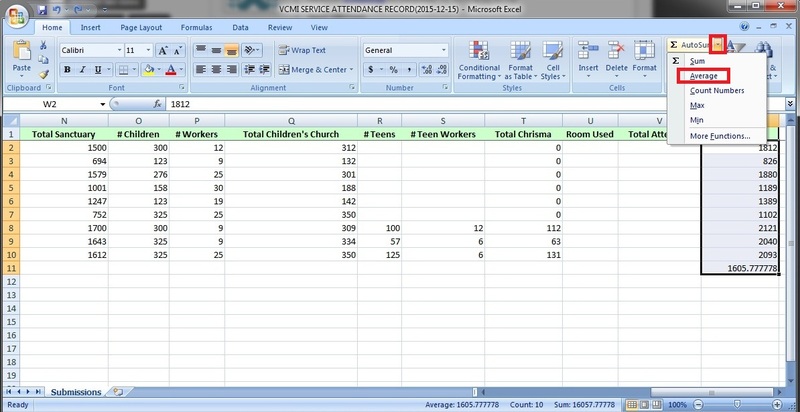 You can achieve that by exporting your data to Excel and than in Excel you can calculate average attendance. I have created excel report from your submission. To calculate average attendance in Excel select your data, then click on AutoSum dropdown option and select Average. You can also partially download form submissions as Excel, if you want submissions only for specific date of between two dates.